Taylor and Huie is an interior design firm and retail space located in the Homberg area of Knoxville, Tennessee. The experienced team of designers at Taylor and Huie have had the privilege of serving clients throughout the United States. Over the past thirty years, they have completed projects in Middle and East Tennessee, the Carolinas, Washington D.C., Florida and Texas. Their design philosophy is rooted in a fine attention to detail and unwavering focus on quality. The designers believe that the interior of a home should complement its architectural foundation. They employ a comprehensive design approach to create personalized, unique, and timeless spaces that reflect their clients’ families and lifestyles. 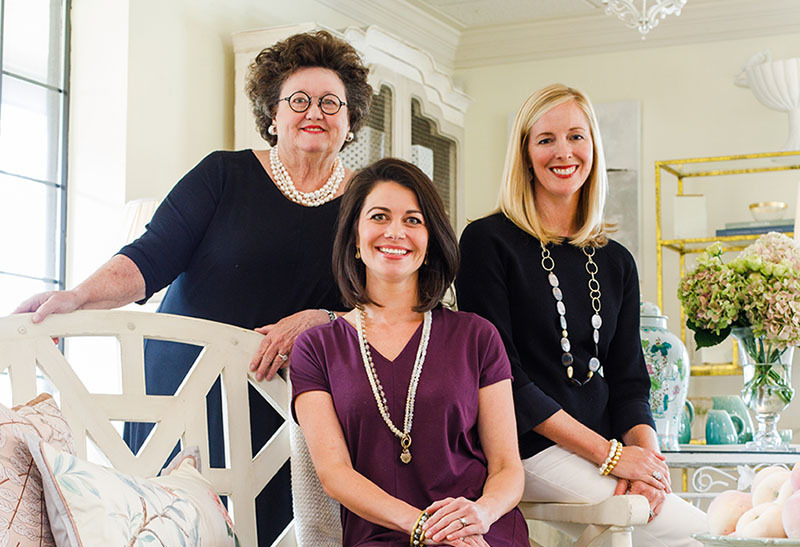 Their knowledge of classic design, combined with the creative ability to blend fine antiques, family heirlooms, and contemporary pieces, sets Taylor and Huie apart. Services are specifically tailored to meet each client’s needs. Full service interior design is available, including new construction projects and renovation assistance. They meet with clients both in the design studio and on-site throughout the design process. With an extensive library of fabrics, wallcoverings, furniture, lighting, and accessories, Taylor and Huie provide their clients the very finest and most current selections. Connie Taylor graduated from the University of Tennessee with a Bachelor of Science in Interior Design. She established Taylor and Huie in 1989. Margaret Rigsby, co-owner of Taylor and Huie, was born and raised in Knoxville. She graduated from the University of Tennessee with a Bachelor of Science in Interior Design. She has been with Taylor and Huie since 2007. Laura Leonard also grew up in Knoxville. She is a graduate of Webb School and Wake Forest University, where she obtained a Bachelor of Science degree. She joined Taylor and Huie in 2017.